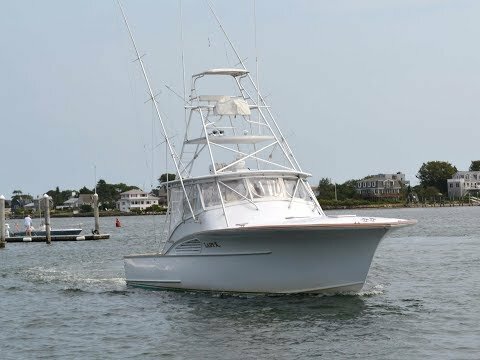 Mike Lohr HLM Boatworks, one of the premier Wanchese, NC builders, worked with with the famous Buddy Davis. Custom built for to commercial performance spec's and finished yacht quaility. Turn Heads Where Ever You go....No Mistaking The Carolina Look. Every Fish Boat is judged by the cockpit. 156 square feet of fishability. Center mounted rocket launcher. Huge Tuna Door, Teak Cover Boards, Hard Rounded Combing. Indeck fish box with macerator. Tackle Center with Rigging Station. Cockpit Sink, Storage Cabinets. Full Tower with Controls. Buggy Top and Bench Seat, Rupp Triple Spreader Out Riggers, Center Rigger. Spreader Lights, Rod Holder on the Tower Legs. Up a couple of steps to the helm deck. Molded fiberglass hard top with hatches for light and air. Under hardtop rod storage. Portside guest bench seating. Stidd helm and companion seats. Starboard side guest bench seat. Center Helm with helm pod and Palm Beach Electronic Matthers Controls. Full Caterpillar Engine monitoring system, engine pyrometers. Bridge Deck starboard side refrigerator freezer. Starboard Side Galley with Corian Counters. Under counter SubZero refrigerator, two burner cook top with cutting board, Microwave, SS Sink and plenty of storage. Forward the offset V-Berths. Cabinet storage. Portside settee with storage above. Full size head compartment with stall shower, SeaLand head with holding tank. Corian vanity with Corian sink. Cat 3176 600 hp Diesels with all updates. Listed at a Fraction of the Replacement Cost..
Professionally Maintained in Yacht Condition. Experience the ride that made Custom Carolina Boats Famous, Join the club..You Know You Want It !